Over the past two summers, about 40 students experienced simulated space flight and zero gravity at NASA’s Space Camp in Huntsville, Alabama — the culmination of a curriculum meant to spark their interest in the science, technology, engineering and mathematics (STEM) fields. But it was the Space Camp week at NASA’s U.S. Space and Rocket Center where the students learned valuable hands-on interplanetary lessons based on science and math concepts. The young astronauts even had to deal with defeat during the occasions they didn’t survive their simulations. Experiments involving everything from zero gravity to scuba diving to being firmly planted at mission control helped the students figure out how to function as a NASA team. 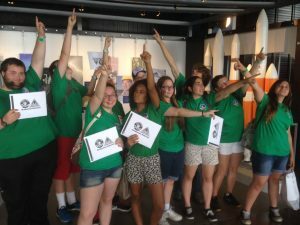 Ten Silver Valley students made the weeklong trip to Huntsville in July 2015 with the help of a grant from the NASA Idaho Space Grant Consortium, which is operated out of UI. The students earned college credit, lived in pods, and met students from New Zealand and Sweden.